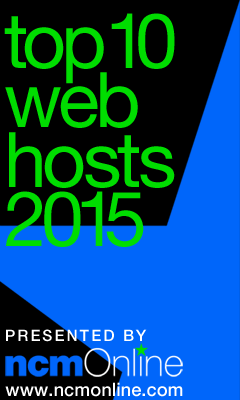 The Top 10 Web Hosts Awards are presented to the ten web hosting companies that provide the best low-cost shared web hosting services. In order to determine the winners, the cheapest WordPress-compatible plans were purchased from 50 popular web hosts. Identical test sites were uploaded to the hosts’ servers and then monitored by an independent third-party testing service for uptime and page-load speed from 13 test locations worldwide every 15 minutes for 10 consecutive days. It is worth noting that 8 of the 10 ranking factors are completely data-driven, while only two — ease-of-use and satisfaction — include reviewer opinion. See the NCM Online Shared Host Ranking Methodology page for complete testing and rating parameters. See the individual host reviews for detailed ratings as well as reliability and page-load speed test results. While none of the 50 hosting services purchased, tested, rated, and reviewed was able to achieve a perfect, 5-star rating average, three hosts achieved the highest average score of 4.7 — A2 Hosting, HostNine, and Certified Hosting. In order to break the tie, the three hosts were ranked in order of average worldwide page-load speed.